A convenient 1M liquid formulation of NaSCN. Use for pre-treating tissue samples prior to application of nucleic acid probes for cytogenetic assays, including FISH. Priced 20% less than the comparable product from Abbott saving the typical laboratory hundreds of dollars annually. Available in two sizes: one liter bottle for use with Coplin jars or staining dishes and four liter container with flow control spout for filling baths on the Little Dipper Processor and Abbott VP 2000 instruments. 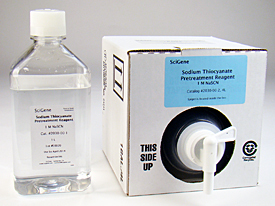 Sodium Thiocyanate Pretreatment Reagent (1M), 1L. Sodium Thiocyanate Pretreatment Reagent (1M), 4L.